From the beginning of time, sacred movement and music have brought people together--at times of seasonal ceremony and celebration, as part of everyday life and life passages, in daily renewal and meditation. The Dances of Universal Peace are part of this timeless tradition. 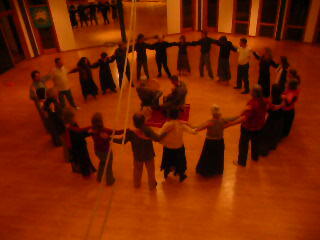 The Dances of Universal peace are a joyous, multi-cultural way to touch the spirit within ourselves and others. The dances use sacred phrases, music and movements from the world’s traditions bring people together. There are no performers or audience all dances taught no experience or partners are needed. We dance on the 4th Saturday of every month in Littleton, MA. Please call us at 978-263-8223 for more information and directions.